ABBOTSFORD, BC JANUARY 8, 2018 – Envision Financial, a division of First West Credit Union has renewed their support of Canuck Place Children’s Hospice with a three-year sponsorship totalling $15,000 in support of the Dave Lede House Abbotsford Music Therapy Program. Canuck Place music therapy enables children with life-threatening illnesses to express themselves emotionally and creatively through music. This allows even nonverbal children to connect with the therapist and loved ones and manage distressing symptoms. Generously donated by Envision Financial, the funds will ensure more children and families continue to have access to this important care. Canuck Place raises 60 per cent of its annual operating budget so community partners like Envision Financial are critical in ensuring the organization can continue to deliver complex care to children with life-threatening illnesses and the families who love them. 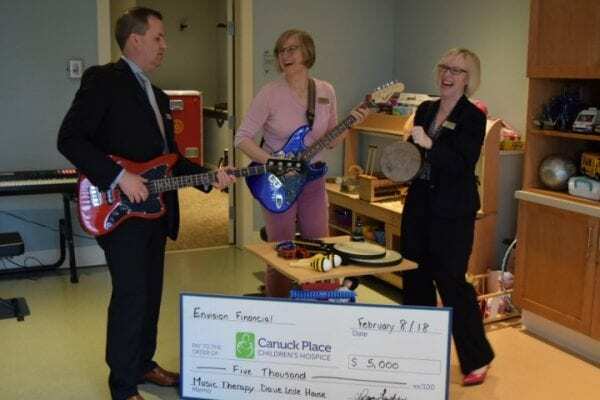 Photo (L to R): Envision Financial President – David Lanphear, Canuck Place Music Therapist – Karin Roberts, Canuck Place Manager of Development in the Fraser Valley Region – Karina Chow.